Ethiopia is the second most populous country in Sub-Saharan Africa with a population of about 95 million people. Agriculture is the main livelihood for an overwhelming majority of Ethiopian population, and it is the basis of the country’s national economy. It accounts for up to 89% of the employment, contributes 56% to the gross domestic product (GDP) and makes up 67% of the export revenues of the country. In Ethiopia, crops and cropping systems are diverse due to large agro-ecological and cultural diversity, which in turn has led to variable cropping patterns. Cereals, such as wheat, barley and teff (Eragrostis tef), and grain legumes (faba bean, field pea, chickpea and lentil) are major staple food crops cultivated in high altitude areas of Ethiopia. Land degradation and soil fertility decline have posed tremendous challenges to increasing agricultural productivity and economic growth in Ethiopia. Nutrient depletion in Ethiopia has several causes. The main ones are nutrient export via harvested products (grain, stover), soil erosion and leaching. The crop productivity decline attributed to the loss of soil fertility limits Ethiopia’s opportunities in striving for food security, development and self-reliance. Traditional stoves in Jimma from Bio Char on Vimeo. Jimma is an important coffee growing area, but only a few private companies and cooperatives are processing coffee for export. Within the domestic market, the coffee husk is not utilised and has become a waste product. In order to take advantage of this resource, Jimma University has evaluated the agronomic effects of formulations composed of coffee husk-derived biochar and the results have been promising. It is hypothesised that the use of biochar formulations (composted with household waste and biomass residues, and complemented with inorganic fertiliser during application) can enhance soil fertility, health and crop productivity, and improve the recycling of agricultural residues. Jimma University is a public higher educational institution established in December 1999 by the amalgamation of Jimma College of Agriculture (founded in 1952), and Jimma Institute of Health Sciences (established in 1983). Over the last few years, Jimma University has established numerous international research and collaboration agreements on the science, production and use of biochar in agriculture. The preliminary investigations conducted by Jimma University and Cornell University since 2012 have demonstrated positive effects of biochar formulations on soil productivity with soils from four eco-regions in Ethiopia, and with on-farm research in Jimma. Greenhouse studies have demonstrated significant crop growth increases through biochar additions in acidic soils of the Jimma region. The ad-hoc biochar formulations developed by Jimma University consist of cattle and chicken manure, coffee husk residue, and bone meal mixed with either biochar produced from coffee husk, or with bone char, mixed and applied at different rates. Biochar constitutes up to 20% of the fertiliser formulations. The biochar formulations are composted for at least two months and, when applied, they are complemented with inorganic fertiliser. The intention is to displace up to 40% of inorganic fertiliser. This has improved crop productivity and access to agricultural inputs and overall farm income. Jimma University, in collaboration with partners, is testing biochar-making stoves in workshops/labs and under farmers’ conditions. Two different biochar-making stoves have been tested for energy efficiency, safety and biochar quality. Economic studies will complement the biophysical studies to examine the viability of this new technology in smallholder farming systems. The projects are ongoing to concentrate on farm-based research and on building business models for large and small biochar businesses. A number of biochar trials will be conducted over three seasons and will advance vegetable crop-cereal-legume intensification. The investigation of the effects of biochar on soil fertility and crop production conducted at Jimma University has expanded in the last few years by including vegetables, soybean and maize in plots managed by researchers and in homestead gardens of smallholder farmers in South Western Ethiopia. The B4SS project will provide top-up funding to continue exploring and communicating the most relevant biochar formulations for the farmers in Jimma, considering the technical, environmental and social constraints. The B4SS baseline survey will be conducted to ascertain the farmers’ knowledge on biochar. It will target thirty farmers that have been involved in the existing biochar trials, and also new farmers interested in biochar. The thirty participating farmers have been using biochar-making stoves for cooking with biomass collected around the household. The farmers have also produced their own compost formulations for growing maize and soybean. The state of knowledge in the use of biochar-making stoves and the effects of biochar formulations on crop productivity will be captured in the survey. The data from the baseline survey will be analysed to help improve the use of biochar for sustainable land management. The biochar-making stoves currently in use will be refined to meet local conditions, and 30 additional stoves will be fabricated, tested for efficiency, fire power, biochar yield, clean operation and cost effectiveness, and distributed to farmers to integrate crop production, energy efficiency and health concerns. The stove technology will be refined and disseminated further based on feedback from farmers. Preparation of biochar formulations in Jimma from Bio Char on Vimeo. The biochar and biochar formulations will be produced using the research-grade heat transformation (pyrolyser) and co-composting units available at Jimma University. Two crop experiments (maize and soybean), each one managed by a different stakeholder (one managed by researchers and the other managed by farmers under field conditions) will serve to test the effects of biochar formulations on maize and soybean. Four biochar demonstration sites will be established. Soybean is a recently-introduced crop in Jimma and may require nodulation to improve nitrogen fixation and response. In addition to evaluating biochar formulations, the effects of inoculation on mycorrhizae development will be assessed as a method in sustainable land management. The most relevant recommendations from the two innovations (refinement of the biochar-making stoves and evaluation of the crop response to biochar formulations) will be synthesised and shared with smallholder farmers, small and micro-enterprises, and agricultural extension institutions for scaling up project activities and disseminating the technology. The recommended practices for the use of biochar in sustainable land management shall also reach policy makers involved at federal, regional and local levels. The farmers using the biochar-making stoves will participate as leading farmers during demonstration activities. The two pyrolysis kilns managed in the research station will also serve for demonstration. The demonstration sites managed by farmers are deliberately situated next to road sides, where more farmers can observe the technologies and be motivated to use the technology. This could contribute to creating demand for the technology. Farmers’ days will be organised every year (around September) to demonstrate crop response and stove operation. Small and microenterprises (SME) will participate in the farmers’ days on the premise that, once the stove is adopted by farmers, the SME will be able to manufacture the biochar-making stoves and sell them to generate income and meet the demand for stoves. Hence, the farmers’ days are platforms to share ideas among farmers, researchers and SME on stove development; biochar production, formulation and composting; application to soil; and tangible outputs of the biochar systems (biomass sourcing, stove manufacturing and use, and biochar production and application to soil). The participating farmers will constitute both women and men. The B4SS good practice guide will include information, for the SME interested in manufacturing biochar-making stoves (such as stove design, testing and fabrication), and for policy makers to inform them about biochar production and use in the region. The guide will be prepared in English and translated into Amharic and/or Oromifa for distribution. The flyers and extension manuals will be prepared and distributed to stakeholders to advance the understanding of biochar formulations. A customised training to SME, smallholder farmers, researchers and development agents will be organised. Feedback on the training workshops will be collected, synthesised and reported to fine tune the subsequent training program. Moreover, M.Sc students that completed their course work and are starting their research program will be recruited and mentored to develop a proposal on the research thematic areas and contribute to the B4SS project. The students presenting a high-quality proposal will be supported in terms of finance and guidance in order to produce a thesis and/or scientific article as a contribution to the project. The focus area will be on high-value crops such as chili pepper, tomato and soybean. In addition, a number of B,Sc students will work with M.Sc students, and generate important data for their senior research project. A validation and dissemination workshop will be organised at the end of the project. The stakeholders involved in the national and local networks, policy makers and international partners will be invited to participate in the dissemination workshop. Local and national news media will be invited to report on the outcome of the project to the public. Future and collaborative research and development projects will be sought and a concept note will be developed. The preliminary results from the first years of field studies have demonstrated the urgent need for long-term data using field-based experiments, since the persistence of biochar provides benefits for which returns have to be assessed over longer periods of time. The B4SS project provides the opportunity to assess the on-going benefits of biochar applied in earlier trials. The production of biochar formulations contributes to reducing waste residues, such as coffee husks, under smallholder farmers and serve as a source of fertiliser produced on-farm, ensuring economic affordability and environmental friendliness. 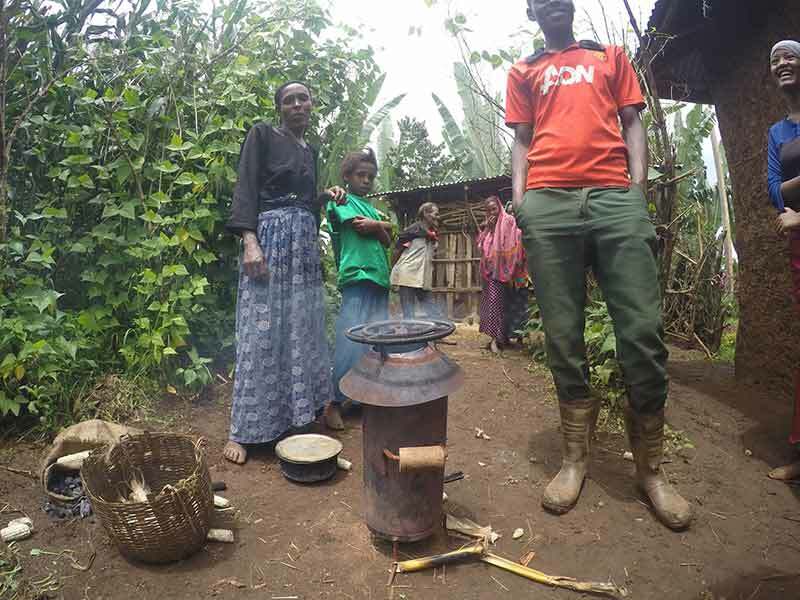 The appropriate use of the biochar-making stoves can complement or completely substitute the three stone cooking fires typically used by poor women in the Jimma region. These stoves can operate with leaf litter and small twigs, resources freely available to poor women. Moreover, the fact that the fuel needed to power these new stoves is freely available close to where rural women live also means that they can reduce the distances they need to travel (walk) to collect fuel wood for cooking. The adoption of the biochar-making stoves could also provide a significant economic benefit to poor women by reducing their need to either purchase or collect wood. These cookstoves could therefore play a key role in decreasing the rate of deforestation in the region. Furthermore, the amount of smoke emitted and indoor air pollution could be reduced and so the stoves could provide health benefits to the region’s poor. Kids collecting wood in Jimma from Bio Char on Vimeo.